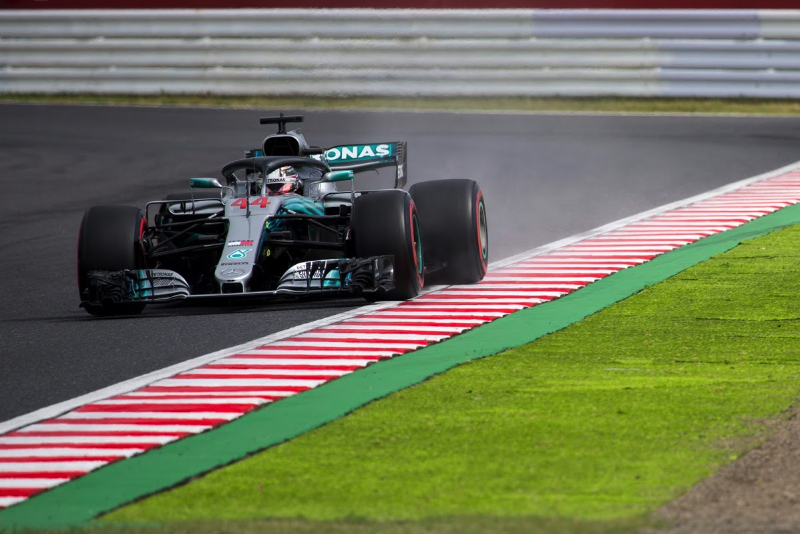 Lewis Hamilton won the pole for the Japanese Grand Prix in a final qualifying session that went from dry to wet. The slippery conditions created a scenario that resulted in his championship rival Sebastian Vettel being only ninth fastest. The line-up for the weekend was: Mercedes – Hamilton and Valtteri Bottas; Ferrari – Vettel and Kimi Raikkonen; Red Bull TAG Heuer – Daniel Ricciardo and Max Verstappen; Racing Point Force India Mercedes – Sergio Perez and Esteban Ocon; Williams Mercedes –Lance Stroll and Sergey Sirotkin; Renault – Nico Hulkenberg and Carlos Sainz; Toro Rosso Honda – Brendon Hartley and Pierre Gasly; Haas Ferrari – Romain Grosjean and Kevin Magnussen; McLaren Renault – Fernando Alonso and Stoffel Vandoorne; Sauber Ferrari – Marcus Ericsson and Charles Leclerc. Hamilton had been marginally quicker than Vettel in the drizzle-interrupted Free Practice 3. Pirelli's tire choices were the medium, soft and super soft. The ambient temperature at the start of qualifying was 79 degrees Fahrenheit (26 degrees Centigrade) and the track temperature was 81 degrees Fahrenheit (27 degrees Centigrade). The gusty winds from FP3 were still around when the 18-minute Q1 began. Hulkenberg had a heavy crash in FP3 but the Renault crew had his car repaired in time for Q1. Vettel posted a 1:29.049. A few minutes later Hamilton beat that with a 1:28.702. Vettel's second attempt on the same set of super softs resulted in a spin. Eight minutes into Q1 the session was red flagged after Ericsson crashed. He climbed out of the car and it was taken away by the marshals. "It was difficult with the wind," Ericsson said later. The order was Hamilton, Vettel, Bottas, Verstappen, Raikkonen, Ricciardo and Ocon when the session restarted. Having not set a time yet, the Renault drivers were now on track and moved into the top 10. Both Williams and McLaren drivers were out of the top 15 with less than five minutes to go. And now a few drops of rain were falling. The five drivers who were eliminated at the end of Q1 were: Hulkenberg, Sirotkin, Alonso, Vandoorne and Ericsson. The fastest 15 drivers who moved on to Q2 were: Hamilton, Vettel, Bottas, Verstappen, Raikkonen, Leclerc, Grosjean, Ricciardo, Ocon, Gasly, Magnussen, Sainz, Perez, Hartley and Stroll. The Mercedes drivers headed out on the soft tires and the Ferrari on the super softs. The top 10 on the grid start the race with the tires they used to set their fastest lap time in Q2. Bottas turned a 1:27.987, which was 0.030 of a second quicker than Hamilton. Vettel and Raikkonen moved into third and fourth. Verstappen grabbed fifth, but his teammate Ricciardo coasted into the pits with a loss of power. With three minutes remaining it started to rain lightly. Leclerc had a spin but didn't hit anything. Ricciardo didn't get back out as his car was not repaired in time. The five drivers who were eliminated at the end of Q2 were: Leclerc, Magnussen, Sainz, Stroll and Ricciardo. The fastest 10 drivers who moved on to Q3 were: Bottas, Hamilton, Vettel, Raikkonen, Verstappen, Ocon, Perez, Grosjean, Gasly and Hartley. It was the first time in the weekend that a driver other than Hamilton had topped a session. The track was greasy and wet as the session began. The Ferraris were on the intermediate tires and the Mercedes on slicks. The rest of the drivers were also on slicks. "I'm going to come in straightaway," Vettel said. And he and Raikkonen pitted for slicks. Hamilton set a lap in 1:27.760, which was 0.299 of a second faster than Bottas. Verstappen took third. The Ferraris were slower, as Raikkonen finished fourth and Vettel went wide and ended up ninth. And now the Mercedes drivers went out for another run. Now the rain was increasing and the track was getting slick. So Vettel was stuck down in ninth. The top 10 qualifiers were: Hamilton, Bottas, Verstappen, Raikkonen, Grosjean, Hartley, Gasly, Ocon, Vettel and Perez.